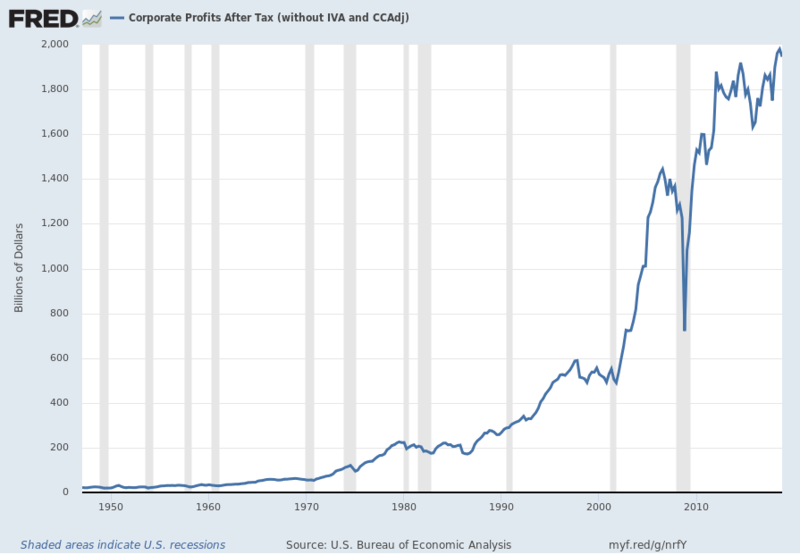 In the last post (“4th Quarter 2018 Corporate Profits“) I displayed, for reference purposes, a long-term chart depicting Corporate Profits After Tax. This entry was posted in Business and tagged Business on March 28, 2019 by Ted Kavadas. Today’s (March 28, 2019) GDP release (Q4 2018,Third Estimate) was accompanied by the Bureau of Economic Analysis (BEA) Corporate Profits report (Preliminary Estimate) for the 4th Quarter. Recently Deloitte released their “CFO Signals” “High-Level Summary” report for the 1st Quarter of 2019. “Each quarter (since 2Q10), CFO Signals has tracked the thinking and actions of CFOs representing many of North America’s largest and most influential companies. How do you regard the status of the North American, European, and Chinese economies? Perceptions of North America declined, with 80% of CFOs rating current conditions as good (down from 88% last quarter), and 28% expecting better conditions in a year (even with last quarter). Perceptions of Europe declined to just 16% and 8%; China slid to 20% and 16%. Page 6. What is your perception of the capital markets? Seventy percent of CFOs say debt financing is attractive (up from 62%). Equity financing attractiveness fell for both public (from 35% to 25%) and private (37% to 27%) company CFOs. Just 46% now say US equities are overvalued—a three-year low. Page 7. Overall, what external/internal risks worry you the most? CFOs express even stronger concerns about trade policies/tariffs, economic risks/slowdowns, and US political turmoil. Talent is again the dominant internal concern. Page 8. Compared to three months ago, how do you feel about the financial prospects for your company? The net optimism index rebounded from last quarter’s dismal +3 to +16 this quarter—better, but still the third-lowest reading in three years. Thirty-two percent of CFOs express rising optimism (26% last quarter), and 16% express declining optimism (23% last quarter). Page 9. What is your company’s business focus for the next year? CFOs indicate a bias toward revenue growth over cost reduction (51% vs. 25%); investing cash over returning it (46% vs. 19%); current offerings over new ones (40% vs. 36%); and current geographies over new ones (64% vs. 12%). Page 10. How do you expect your key operating metrics to change over the next 12 months? YOY revenue growth expectations fell from 5.5% to 4.8%, earnings growth slid from 7.3% to 7.1%, capital spending rose from 5.0% to 5.9%, and hiring fell from 3.2% to 2.1% (all sit below their two-year averages). Dividend growth declined from 4.5% to 3.9%, the lowest level since 4Q17. Page 11. Where does your company stand with respect to downturn planning? Nearly 85% of CFOs say they expect a US downturn by the end of 2020, and they overwhelmingly expect a slowdown rather than a recession. A minority say they have detailed defensive or opportunistic plans. Pages 12-13. If you believe a downturn will occur, what is driving your belief? CFOs were most likely to cite US trade policy, business and credit cycles, and the impacts of slowing growth in China and Europe on the US economy. Page 12. What defensive actions will your company take? The most common actions involve reducing spending and limiting or reducing headcount. Page 14. In which policy areas would your company like to see Washington provide clarity/change first? CFOs overwhelmingly rate trade policy the most important policy area, with infrastructure investment a distant second. Page 15. Own-company optimism rebounded from last quarter’s 10-quarter low, but it remains at one of its lowest levels in three years. The proportion citing “no change” reached a new survey high— likely a negative sign given last quarter’s strong pessimism. Last quarter’s net optimism declined sharply to just +3—the lowest reading since 1Q16. This quarter it rose to +16, but it still represents the third-lowest reading in three years. Thirty-two percent of CFOs expressed rising optimism (up from 26%), and 16% cited declining optimism (down from 23%). Net optimism for the US improved from last quarter’s +9 to +19—still its second-lowest level in more than two years. Canada rebounded from last quarter’s dismal -36 to +25. Mexico fell again and is at its lowest point since 1Q17 at -60. Manufacturing, Retail/Wholesale, and Healthcare/Pharma were comparatively pessimistic (all at zero). Financial Services and Services were much stronger, with both above +30. Please see the full report for industry-specific charts. Note that industry sample sizes vary markedly and that the means are most volatile for the least-represented. Due to a very small sample size, T/M/E was not used as a comparison point this quarter. 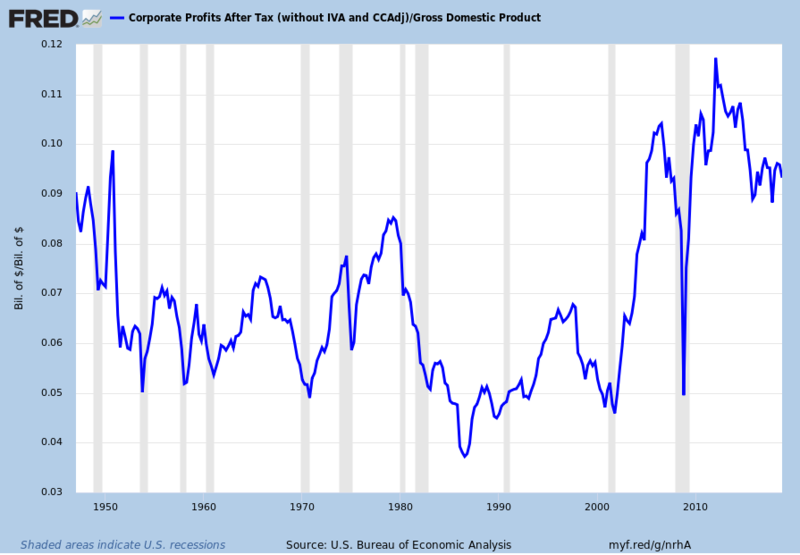 Expectations for revenue, earnings, dividends, hiring, and wages all declined (only capital spending rose), and all metrics sit below their two-year averages. Revenue growth declined from 5.5% to 4.8%, one of its lowest levels in two years. The US fell to a two-year low. Canada rose, but is below its two year average. Mexico declined and is below its two-year average. Technology and Energy/Resources lead; Manufacturing and Retail/Wholesale trail. Earnings growth declined from 7.3% to 7.1%, a two-year low. The US fell to a two-year low. Canada improved, but sits at its second-lowest level in three years. Mexico remained near its two-year average. Retail/Wholesale and Healthcare/ Pharma are highest; Manufacturing is lowest. Capital spending growth rose from 5.0% to 5.9%, but is still the second lowest level in two years. The US rose, but sits at its second-lowest level in two years. Mexico rose sharply but remains below its two-year average. Canada rose above its two-year average. Healthcare/Pharma and Retail/ Wholesale are highest; Manufacturing is lowest. Domestic personnel growth fell from 3.2% to 2.1%, the second-lowest level in two years. The US fell to its lowest level in more than a year. Canada declined to near its two-year average; Mexico fell to a five-year low. Services and Technology lead; Energy/Resources trails. Dividend growth declined from 4.5% to 3.9%, the lowest level since 4Q17. The Index of Small Business Optimism increased in February by .5 points to 101.7. Further details regarding small business conditions can be seen in the full February 2019 NFIB Small Business Economic Trends (pdf) report. This entry was posted in Business and tagged small business on March 12, 2019 by Ted Kavadas. Recently Deloitte released their “CFO Signals” “High-Level Summary” report for the 4th Quarter of 2018. How do you regard the status of the North American, European, and Chinese economies? Perceptions of North America declined, with 88% of CFOs rating current conditions as good (down from 89% last quarter), and 28% expecting better conditions in a year (down from 45%, and a five-year low). Perceptions of Europe declined markedly to 23% and 7% (from 32% and 23%), and China also declined sharply to 24% and 12% (from 37% and 27%). Page 6. What is your perception of the capital markets? A four-year-low 62% of CFOs say debt financing is attractive (73% last quarter). Attractiveness of equity financing fell for public company CFOs (from 42% to 35%) and also for private company CFOs (53% to 37%). Sixty-five percent of CFOs now say US equities are overvalued—down from last quarter’s 71%. Page 7. Overall, what risks worry you the most? Following the US midterm elections, external risks have become an even stronger focus. CFOs express concerns about trade policy and political turmoil, and rising worries about economic growth. Talent is again the top internal concern. Page 8. Compared to three months ago, how do you feel about the financial prospects for your company? The net optimism index fell drastically from last quarter’s +36 to just +3 this quarter—the lowest reading in nearly three years. Just 26% of CFOs express rising optimism (48% last quarter), and 23% express declining optimism (12% last quarter). Page 9. What is your company’s business focus for the next year? CFOs indicate a smaller bias toward growth over cost reduction (50% vs. 21%) and a lower bias toward investing cash over returning it (48% vs. 18%). The bias toward current offerings over new ones shifted toward new (43% vs. 40%), and the bias toward current geographies over new ones decreased (60% vs. 17%). Page 10. Compared to the past 12 months, how do you expect your key operating metrics to change over the next 12 months? 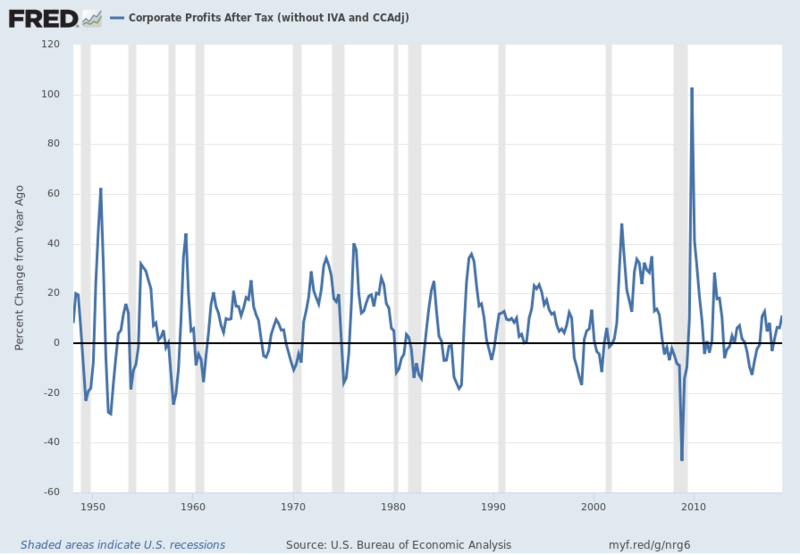 Revenue growth expectations declined from 6.1% to 5.5%, and earnings growth declined from 8.1% to 7.3% (their lowest levels in one and two years, respectively). Capital investment slid from 9.4% to just 5.0% (the lowest level in two years). Domestic hiring rose from 2.7% to 3.2% (matching its survey high). Dividend growth fell from last quarter’s very high 7.4% back to 4.5% (the two-year average). Page 11. What are your expectations for the macroeconomy in 2019? The vast majority of CFOs do not expect the US, Canadian, or Mexican economies to improve, and 55% expect a US recession by 2020. Expectations for business spending declined sharply, and those for labor costs rose. Page 12. 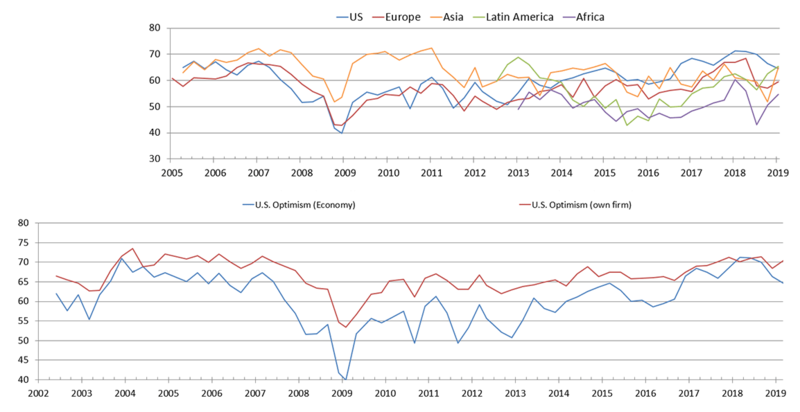 Optimism plummeted to its lowest level in nearly three years, with all countries registering some of their lowest-ever readings. CFOs citing declining optimism nearly matched the proportion citing rising optimism. Net optimism declined very sharply, from last quarter’s +36 to just +3—the lowest reading since 1Q16, and the third straight decline. Just 26% of CFOs expressed rising optimism (down from 48%), and 23% cited declining optimism (up from 12%). Net optimism for the US reached its lowest point since 1Q16 at +9. Canada fell to a new survey low at -36, and Mexico fell to its lowest point since 1Q17 at -43. Sentiment declined for nearly all industries. The strongest gains were in Technology, which rose from +17 to +25 following last quarter’s sharp decline. Sentiment fell most sharply in Manufacturing (to a 7-year low), Healthcare/Pharma, and Services. Please see the full report for charts specific to individual industries and countries. Expectations for sales, earnings, and capital spending declined and are at or below their two-year averages. Expectations for hiring and wages rose. Retail/Wholesale and Technology are the relative bright spots. Revenue growth declined from 6.1% to 5.5%, even with its two-year average. All three countries declined to their lowest levels in a year, with the US and Mexico still above their two-year averages and Canada below. Technology and Energy/Resources lead; Manufacturing and Healthcare/Pharma trail. Earnings growth declined from 8.1% to 7.3%, its lowest level since 4Q16. The US fell below its two-year average. Canada fell to its lowest level since 3Q15, and Mexico rose slightly. T/M/E and Technology are highest; Financial Services and Healthcare/Pharma are lowest. Capital spending growth declined sharply from 9.4% to 5.0%, a two-year low. The US and Mexico fell to their lowest levels since 4Q16; Canada declined sharply to its lowest level in a year. Retail/Wholesale and Services are highest; Energy/Resources and Manufacturing are lowest. Domestic personnel growth rose from 2.7% to 3.2%, again above its two-year average. The US rose to just below its survey high. Canada rose to well above its two-year average; Mexico rose to an eight-year high. Retail/Wholesale and Technology lead; Financial Services and T/M/E trail. Dividend growth declined sharply from 7.4% to 4.5%, erasing last quarter’s marked uptick. This entry was posted in Business and tagged Business on January 10, 2019 by Ted Kavadas. 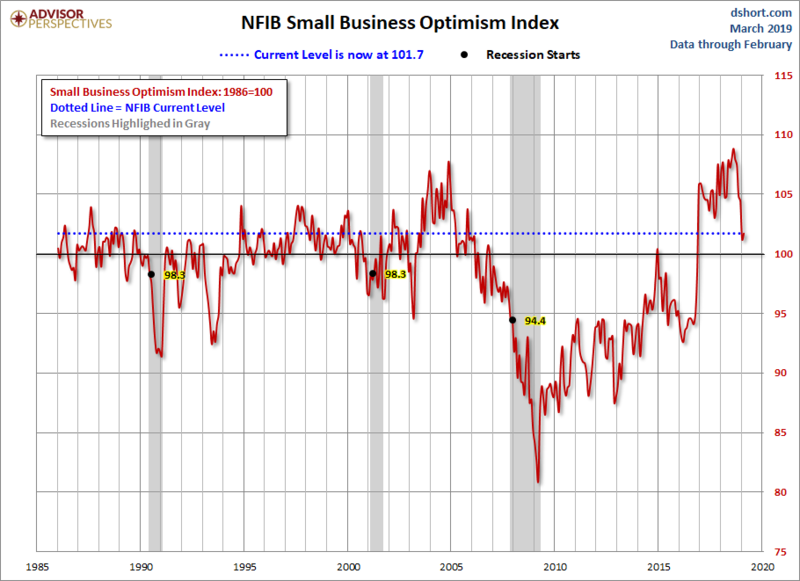 The Index of Small Business Optimism decreased in November by 2.6 points to 104.8. Small business optimism posted a modest decline in November with a reading of 104.8, while continuing its exceptionally strong two-year trend, according to the NFIB Small Business Optimism Index. Slightly more than half of the decline was attributable to Expected Business Conditions and Expected Real Sales. Increases in compensation tied a near 30-year high as owners seek to attract more qualified candidates. An increasing percentage of owners reported capital outlays and higher sales. Further details regarding small business conditions can be seen in the full November 2018 NFIB Small Business Economic Trends (pdf) report. This entry was posted in Business and tagged small business on December 11, 2018 by Ted Kavadas.